How to get contracted developers to read, accept and adhere to development guidelines? Feb 06, 2018 at 06:40 AM | 1.4k Views | Last edit Feb 06, 2018 at 06:41 AM 3 rev. as you can tell, my question is more of a process than technical nature and I'm basically looking for some ideas and how-to's. Where this often breaks down, is that the PDF-doc doesn't get send out in the first place and there's also no formal process to have the developer aknowledge that s/he received, read and understood the guidelines and plans to adhere to them. Have any of you implemented some kind of process within SAP to streamline and document this? 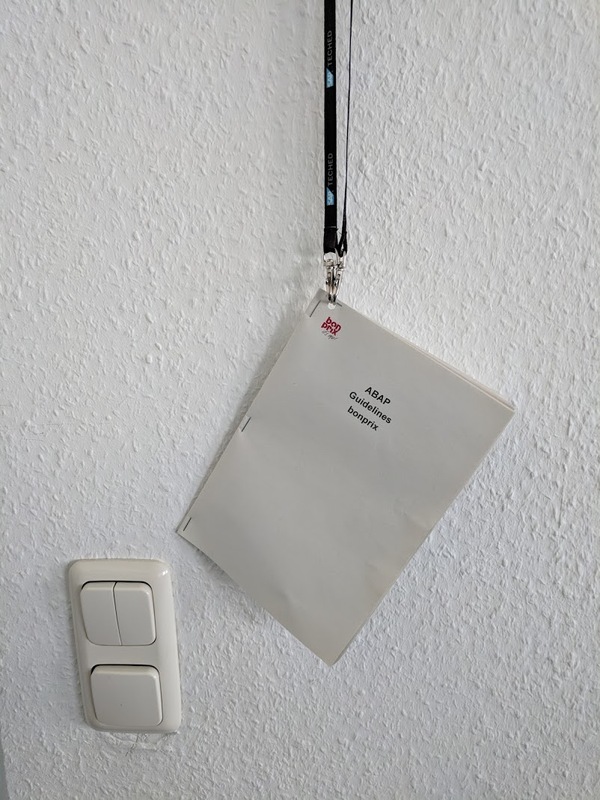 I'm for example wondering if it could work to send the PDF-document via the SAP Business Workplace as an express document to new developers, and have them aknowledge that they received and read them via response message. They'd then only get their developer keys after we received this response. Are there perhaps even some standard workflows for something like this? Do you have other suggestions based on what is already done elsewhere? Thanks for any feedback you have! Thanks to all who provided answers, comments, feedback and suggestions in this lively thread! I just now picked Mike Pokraka's response as the "best answer" as his suggestion will be what I'm going to implement. All the other feedback and discussions in this thread also provided lots of food for thought and I have a hunch that there's ample material for a blog post or two just waiting to be written to summarise some of the content. If it's okay, I'll not close the discussion so that it stays open for any additional thoughts and suggestions. This is so funny, because it's one of the simple examples I dreamt up for the Workflow book (Ch. 16.3.2 in the third edition if you have a copy somewhere in your office). To summarize: Put a dummy task with all the information as the task text in a workflow, and use the task's 'confirm end of processing' flag to act as a confirmation. As part of your onboarding send it to them. But when I read "we don't have a proper QA-process (yet)" I would really focus less on guidelines and more on code quality. Time spent on this type of thing is better spent, I've seen some truly awful code that confirms to guidelines, and on the flipside there is no one size fits all when it comes to guidelines. Use code inspector and start adding the worst transgressions to your custom checks. cool that the authors' proceeds go to charity! And a heartfelt "Yes" to your PS! I would have loved to pick several helpful answers but as that is not available I went with a "thank you all" comment to my OP. I've worked in many places. In some, developers have a good attitude and you can trust them to read and adhere to the standards. In other places, the only way to get them to adhere is to stand over them with a hand gun (I think this is called "pair" or "extreme" programming). Seriously, if you've got externals who won't do what they're told - sack 'em. For internals, you just have to do whatever the social acceptable form of beating is in your organisation. I've no time for people who won't adhere to a few simple rules - either they're not to be trusted, or they're incompetent. Peer code review is a good approach if you don't have enough resource to have a separate QA section. It also means that you've got (supposed) experts doing the work. This does rely on attitude. I remember one project I was on, where it was done diligently, as the developers realised that they could learn off each other not just the standards, but good techniques. It became a game to find violations. In another project, the developers found that the regulatory authorities were happy with a signature that a review had been carried out - so they just signed off every development without looking at them. I was in charge of all the developers across the project, and did a few spot checks and discovered this - unfortunately, the higher management team didn't give a monkey's about actual quality, so they took no action. An important factor in peer code review is that a junior reviews a senior and vice versa. That way everyone benefits and it spreads the load and programming knowledge and good practice. If your standards don't contain too much that's irrelevant, that will help. Concise standards are far more likely to be adhered to than a fifty page document. Don't sweat the small stuff. I strongly recommend removing anything that says that, e.g. local variables must be prefixed with l_ . Rather follow Horst Kellers guidelines in the book "Official ABAP Programming Guidelines". A few years ago, I got to define the standards for a client. That was it. But that was with a small, close knit team. For a larger team, you do have to enlarge on what those terms means and give guidelines for achieving them. For most clients, I have to sign I've read the guidelines and standards and will adhere to them. For some, everyone now and then I have to sign I've re-read them. For one, this is achieved and recorded through LSO. In their validated systems, there are ATC checks that must be passed. This works quite well, as it has spotted some programming issues that I'd missed. If you have some processes and restrictions that are an absolute must, put them into ATC and block release of transports that don't pass the checks. But to my mind, for improving code quality and ensuring adherance to the rules, nothing beats a peer code review (with spot checks to spot sign offs without checking). > There is no F6 - "Request text on/off" in version screen? Oh, I've seen that button before, but never cared for it! So I, too, learnd something new here, thanks Tomas Buryanek ! Let me start by saying that the last question you posted (and referenced here) is a remarkable example of how to use this platform, and it looks like you are keeping it up (maybe consider blogging as well, we could all benefit from it, I believe). Now to the matter at hand, as I second Matthew Billingham point of the importance of code review, I would also add that you need to put in place some "ego canceling" method (e.g. someone that code review is its only job and that every remark is being handled professionally and with reasoning behind it to justify it). Have a daily system message with some part of the guidelines. Have a UE\enhancement\Badi added to the SE38\80 that blocks the use of it unless they check mark the read of the guidelines. When opening a user for a developer have it in place that before receiving the user and password they have to confirm the guidelines or pass a quiz on them with some score threshold. Have a random programmer checked for those guidelines and email conclusions to the entire team (do that in a way you don't single out someone, did I say "ego canceling" already :) ). Send the programmers (unlike my first point which sends to all the users) a message (it could be done based on this - didn't test it myself). Single out your weakest link / most important project and focus your code review resources on it. This list is, of course, incomplete and is adding (sometimes even in a tangent) to other points that were already made. When I have some time, I'll deal with it. Badges will surely help here... You can get badges for completing a review, finding different types of errors, responding to review comments... Ah the possibilities are endless! Hook it in to the branch merge (pull request in GitHub) functionality of ABAP git, and we could have an ABAP development environment that might even be fun! Unfortunately seems to be the sort of thing that only gets addressed in demojams. You could do the scoring according to least number of issues found. Of course, you'd have to carefully audit. I see the challenges Bärbel mentioned as well in my organisation. Please: @Management: Let those geeks do their work an care for quality, similarity, and code perfection! it will pay out over the runtime of the system. - Print some exemplars of you dev. rules and hand them out to every new developer. - review your guidelines: not to overfloat them and rewrite an ABAP Book. - offer information / training even to externals consultants how to use ATC to simplify their everyday work. I am answering your question assuming your emphasis is more on how to make the developer adhere to Dev guidelines. 1. Strictly enforcing code review and then let the developers take the corrective action on the review comments. 2. Only after Step 1 is done, approve the changes to be moved to QA. "Adherence to the guidelines basically hinges on the developers' good will"
Other way is link it to Money. Cost saving and over a period of time, People will fall in line. So even though this is an "after the facts" -approach, it could atleast make the general Compliance with your Coding Guidelines and Culture visible? Thanks for your feedback, Nic! A while ago I "played" a bit with the BAdI you mention (ZCL_IM_CTS_REQUEST_CHECK), but for the transport creation to try and get developers to put some specific type of information into the title. These trials however never made it out of a sandbox system thus far. The aspect of running SCI during task- instead of transport-release will hopefully soon get tackled by setting up a central ATC-system with the latest version which will allow this option via configuration of the checks. Once we have this system up and running, we'll also start making use of preventing release of a task/transport with errors. We've started putting some of our guidelines (including naming conventions) into a Code Inspector Check Variant. We've developed some custom checks as well for things that are not available in SAP standard. I would like to mention this excellent resource on this occasion: Git repo with ABAP Open Checks. Every developer is encouraged to use this variant from the start of development and not only at the very end. The Check Variant is configured as mandatory on release of transport and any prio 1 or 2 finding will block the release. While externals are not allowed to release transports themselves they are still responsible for fixing their code until it can be released from DEV, so it will come back to them. Developers are adapting quickly and are making sure that their transports can be released and are not blocked for some days until they are back in the office and have the business area waiting in their door because testing could not be started in e.g. the QAS system. So far our experience with this is quite positive and we will definitely continue on this route. That's a shame and I do sympathise with your difficulties. What's needed is for adherence to client development standards to be written into the outsourcing contract - i.e. if they don't adhere, they're in breach. Unfortunately, if you've management who view developers as a commodity (one pretty much the same as another), then there's not much you can do. (See Michele's blog here). 3 - All code is code reviewed. Included as part of that is the mandatory use of the code inspector with agreed upon categories that we have documented. If the code fails the code inspector then that is marked up as such as well. 4 - We have a spreadsheet where we track the result of all code reviews and we also include major categories as to why it failed and we review that data at every meeting. The spreadsheet is viewable by all but only modifiable by the code reviewers. 5 - If all else fails, we have terminated a few people who are consistent repeat offenders or who we have felt isn't cutting it. 1 - Admit you made the mistake to the person in an email. If applicable, let the entire team know. 2 - Correct the data you have in the scoring system you are using (in my case, it's updating the spreadsheet that the initial review passed) and let that person know it was corrected. It will make them feel a lot better if you admit you made a mistake to them and that you corrected the data. 3 - We have code reviews enforced by Charm. A piece of code cannot get from development to QA unless a code reviewer has reviewed it and marked it as approved. 2 - If you bring an issue to the team where there is a pattern, there is little to no need to show who created or caused the issue. When I present issues that I want to point out, I purposely remove any and all identifying information including the name of the program where I found the issue and used as an example. This goes along with point #1 in not making it personal. 3 - Be professional. There is no need to slam someone for something and call them names, just point it out what the issue is and if necessary what pages in the standards it violates. One reason for this is that if the reviewer makes a mistake and isn't nice about it, it really comes back to haunt you if you were wrong and it doesn't make you look good. 4 - Be consistent and firm. If you ding something for one person, you need to ding the same thing for everyone. If you let one person get away with something and someone else got dinged repeatedly, this leads to a very quickly escalating credibility issue. 5 - Have a consistent escalation process for repeat offenders. If a person is repeatedly doing the same thing and getting dinged on it, you can define an escalation process that first brings it to their attention and then if that doesn't fix it you can increase what you do. These are things I have learned over a career of doing software QA for not only software development at my current company but other software development work as well for other companies including a contracting firm. Barbel - you're welcome and thank you for the compliments. My advice is just keep plugging away at it and making incremental improvements and before you know it things will have improved. When we first started doing code reviews, we didn't have a spreadsheet, we didn't have the code inspector process, and we didn't have charm. All of those things were implemented over time and we continually evaluate our processes to see where they can be improved.